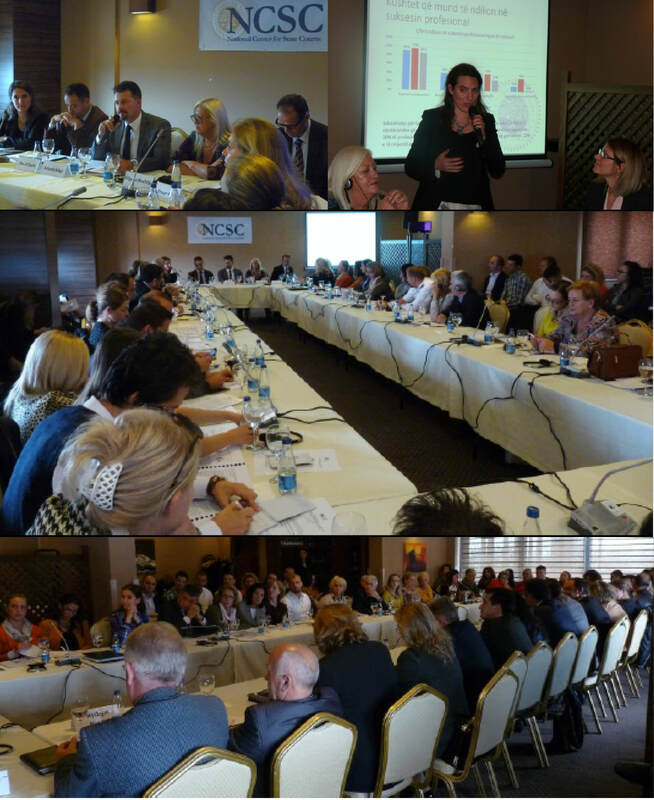 On September 30, 2015, NCSC organized a roundtable for the official launch of “Finding our Voices”, a mapping of youth aspirations, opportunities, and challenges in entering the legal workforce in Kosovo. The study, conducted between April and June 2015, draws conclusions from 156 survey responses from law students and legal professionals and presents recommendations for the Kosovo Judicial Council, Kosovo Prosecutorial Council, Kosovo Bar Association, and law faculties to bridge the gap between legal education and entry into the legal workforce. Kosovo’s legal workforce is characterized by a youth deficit and underrepresentation of women. More than 50% of judges and prosecutors and 80% of lawyers are above the age of 50. Women participation remains low with women representing only 13% of lawyers, 29% of judges, and 36% of prosecutors while they are enrolled in law faculties in equal numbers as their male colleagues. Despite evident needs for new entrants, young graduates remain convinced that they are not employable. Concerns for their lack of preparedness for the workforce, insufficient practical opportunities, and unavailability of jobs results in a lack of confidence to pursue legal careers and short-term choices that affect their ability to meet the conditions to enter the professions of lawyer, judge or prosecutor. Presentations from the Dean of the University of Pristina Law Faculty, the President of the Kosovo Judicial Council, the President of the Peja Regional Branch of the Kosovo Bar Association, the President of the Forum of Women Judges and Prosecutors, the Chair of the Kosovo Bar Association’s Gender Committee, and the Director of the Judicial Performance Review Unit of the Kosovo Judicial Council’s Secretariat called upon institutions, professionals, and students to work together to address these challenges, prepare students for the workforce, and open the path for their entry into the professions of judge, prosecutor, and lawyer. We hope these actions will inspire students to ask questions, apply for opportunities, and meet with professionals to define their own career paths with conviction and dedication for the law and justice. udents to work together to address these challenges, prepare students for the workforce, and open the path for their entry into the professions of judge, prosecutor, and lawyer. We hope these actions will inspire students to ask questions, apply for opportunities, and meet with professionals to define their own career paths with conviction and dedication for the law and justice.